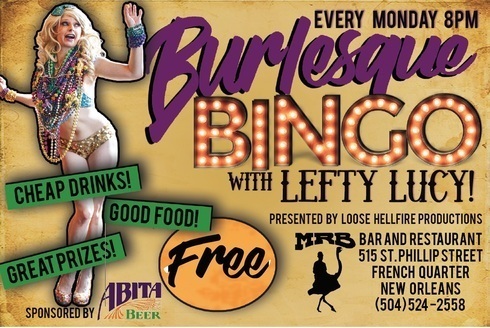 Come play the French Quarter's favorite weekly grown-up game show — Burlesque Bingo with Lefty Lucy! Each round winner gets a PLATTER of prizes including exclusive prints by Daniel Grey Photography, gifts from Abita Brewing Company, & a grand finale prize from a variety of local sponsors! Just for showing up you get to enjoy the free BURLESQUE side of this unique game! Between every round, Lefty Lucy performs an improvised striptease to a song the crowd selects, removing only one item per round—Don't miss your chance to win the finale prize, and to see the tassels twirl! HUNGRY? We got you! Enjoy food from the kitchen in our courtyard! Games start at 8pm. Multiple rounds played.